For more than 10 weeks now, French universities have been disrupted by strikes, mass meetings, demonstrations and occupations as a daily occurrence in an unheard-of wave of protest by university staff and students against President Nicolas Sarkozy's neoliberal reforms of higher education. A dozen mass demonstrations with tens of thousands of people have been held, motorway tollbooths have been occupied and university council meetings invaded. Parallel university lectures, in streets, shopping centres or on trams have been used to help popularise the movement that shows no sign of stopping. In a spectacular action known as "The springtime of the chairs", all the chairs were removed from many universities to stop classes and used to build protest sculptures. "University all night long" events were organised while in front of the Paris town hall there is a permanent march, 24 hours a day, that began three weeks ago. When Sarkozy mocked the idea of studying "old literature" such as The Princess of Cleves, the movement reacted with public readings of this work (considered to be the first true novel written in French, in 1678) across France and a parody of it lampooning Sarkozy circulated on the internet. One group of researchers produced a movement rap song and hundreds of staff have resigned from their administrative responsibilities. Though some of the trade union leaderships and many trade union activists have played an important part, the movement is independent of any particular organisation, and is impressively democratic. There have been eight, day-long national delegate meetings to decide on strategy and tactics, and the movement is far from over yet. University lecturers had previously been moderate and 'sensible' in the extreme and had not had a national strike for at least 30 years. They tended to follow mass student movements with a tolerant but very distant gaze. The stereotype of hordes of Marxist lecturers in French universities, if it ever was true, is at least 25 years out of date and many were more used to dusty seminars than to noisy demonstrations. As the weeks went by, teaching staff were joined in many universities by students (some mass meetings attracted more than 2,000 students) and sometimes by technical and administrative staff. Often students subsequently took the lead in organising mass actions while separate national delegate meetings for students, for administration and for doctoral researchers, hammered out lists of demands and tactics for action. Many universities have been occupied or blockaded and in one or two places, the presidents were blocked in their offices with one physically attacking a student. Two major government attacks sparked off this unprecedented action. The first involved the working conditions of university staff: whereas at present all lecturer-researchers are paid to do 50% teaching and 50% research, the government proposed that university presidents would decide who should do more or less research or teaching, fixing a "job balance" for each individual according to whatever priorities the president chose. This proposal was to be only the first step to the introduction of full-scale managerialism, with a focus on profitability and private funding before everything else, whereas at the moment collegial organisation is still strong. The almost-simultaneous announcement that university presidents would have their salaries increased by "at least EUR20 000" showed the real aim. This was accompanied by measures and speeches by Sarkozy and his friends that made their intentions even clearer. Far more money was available in tax breaks for company research and development programmes than for university and public sector research. Sarkozy's concept of research seems to be limited to the 'need' for French capitalism to be competitive, and his favourite criterion is "how many patents have you put in for?" Researchers in history, mathematics, social sciences, biology, literature and many other areas do not see the world like this. Sarkozy went on to announce, in a speech in January, that French researchers were conservative, comfortable, refused to have their work evaluated, and published "30 to 50% less than British researchers on a similar budget". The speech, filled with untruths, infuriated even the most moderate academics and made clear the reforms announced were part of a wider commitment to reduce universities to a subservient status of private companies. Students realised such a process threatened them too. At the moment, it costs less than EUR300 to enrol at university although a group of 92 Conservative MPs sponsored a parliamentary bill in February to make students pay high tuition fees, with a US-style system of student loans to be paid back from later salaries. An OECD report in February called for much higher tuition fees to be imposed, this despite the fact that a similar system imposed in Britain 10 years ago has led to tuition fees of more than EUR4,000 a year and rising, as well as to a sharp fall in the number of students from poorer families going to university. As part of the post-war settlement, and also as a result of the struggles of 1968, the French university system contains a large dose of collegial organisation. Recruitments, promotions and so on are decided, for lecturer-researchers, by the National University Council which works on a largely unpaid basis and of which two thirds of the members are elected by lecturers and professors. Far from perfect, the system has nevertheless meant that staff have a very large measure of freedom in choosing what research to do and when, and are under very little managerial pressure. But it has been being eroded for some time with job cuts in administration leading to a bigger administrative workload for lecturers. Constantly changing ministerial demands on the content of programmes have made life harder for teaching and administrative staff while more and more lecturer jobs have been replaced by 'teaching-only' posts (with double the teaching hours). These positions have been filled by secondary school teachers who often undertake research anyway but do not get paid for it. But these latest government plans were of a different order altogether. The second major attack, carried out simultaneously in a bizarre ignorance of basic political tactics, was aimed at replacing the national competitive examination which recruits secondary school teachers with a wholly new system, introduced without consultation and made up of 'Masters in Education'. The new scheme would mean it was more expensive to train to be a teacher since under the current system trainee teachers in their final year are paid. As well, the standard expected of new teachers in their own discipline would be lowered and, even worse, the proposed system is specifically designed to ensure tens of thousands of teachers would be casual contracts - those who would have a masters degree in education but were not qualified to take on full-time posts. This proposed reform angered university lecturers who teach the competitive examination and the trainee teachers themselves. As the weeks went by and the movement remained determined, the government offered a series of concessions. A freeze on job cuts for two years was announced, with an increased role for the CNU in deciding promotions and evaluations. The government also wrote into the new decree the right for a lecturer-researcher to veto changes in their job balance, and it delayed part of the masters in education scheme for one year. The government also agreed to some old if minor demands of the trade unions on other issues. Vigorous debate continues about the value of these concessions and while the dynamic of the attacks on the government has been slowed, it has not been abandoned. Putting universities into competition with others is at the centre of the government's strategy and is a key principle for Sarkozy's government. Similar attacks on the public hospital system have caused outrage and 25 of the top hospital chiefs signed an open letter denouncing the centrality of purely economic measures for hospital care. The least combative of the four trade unions for university teaching staff agreed to sign an agreement with the government but the most important unions, and many thousands of non-unionised lecturers, are not satisfied with the concessions and remain determined to continue the movement. Strikes have not been the only method used by the protesters: the new teacher training programme needs to be written by lecturers and 90% of universities have refused or have refused to submit them to the minister. The scheme cannot go ahead without the programmes but the government is hoping that the movement will collapse and then they will trickle in. This seems unlikely. Some university governing councils have voted to call on the government to withdraw the reforms and, as protests continue, the government will probably back down further. Whether it will manage to calm the movement simply by postponing the reforms and making secondary concessions is far from clear. Although it is uncertain if the government will back down, already the movement has transformed tens of thousand of lecturers who have been confronted with new problems other social movements had seen before them. Of particular concern are the problems of media bias and of police violence against demonstrators. As I write, the movement remains determined and strong, and an all-out victory cannot be ruled out. 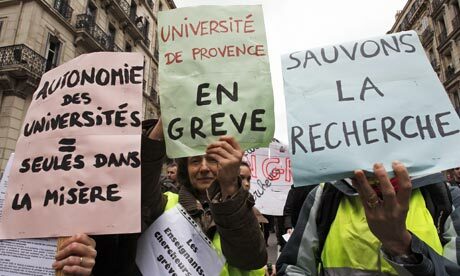 Sarkozy may come to regret having transformed more than 50,000 lecturers into angry opponents. * Last Wednesday, the government ratified the contentious decree on the status of lecturers. Two other decrees approved by ministers concerned the operations of the CNU and entry classifications of university lecturers and professors.